Junior Isabella Tran gets ready to hit the ball back to her opponent during practice Feb. 27. 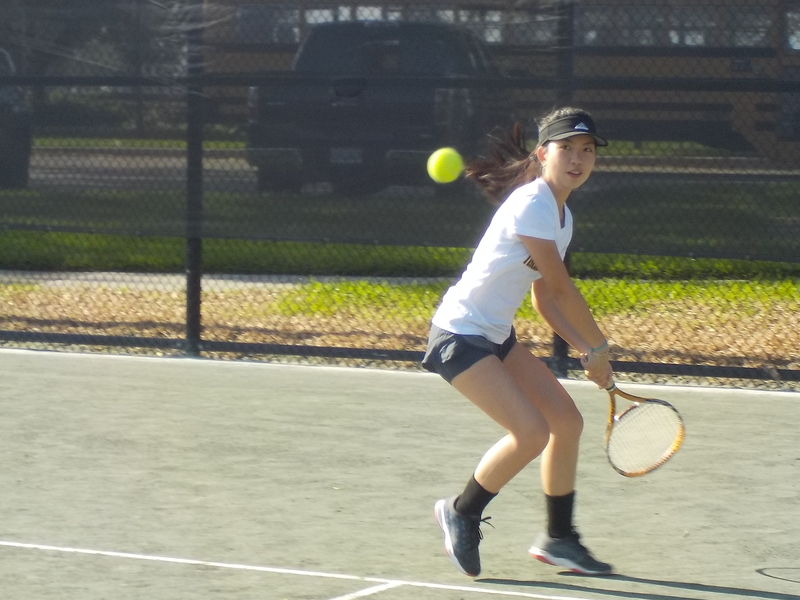 As the tennis season started back up in the middle of February, junior Isabella Tran was eager to get back onto the courts. Tran has been playing tennis for about seven to eight years now, half of her lifetime. “I first discovered my passion for tennis when I began watching my older sister play,” Tran said. Tran decided to follow in her sister’s footsteps, crediting her as her most important inspiration for picking up a tennis racket and ball. Being on the team since freshman year, Tran has remained consistent with her main goal for each season. This season is no different. “I want to win one match at districts,” Tran said. Her main strategy on the court is to stay calm and focused. The team’s friendly atmosphere as a whole helps create a healthy playing environment. “In my opinion, the team’s best quality is how we are able to help each other,” Tran said. Although Tran has a lot of experience with tennis, she credited Coach Messano for always challenging her on how she can improve. “Coach helped me learn how to become better at volleying,” Tran said. Even though sports and academics don’t mix for all students, Tran feels no pressure as she succeeds in both. “You have to know how to manage your time,” she said. While Tran does not have any plans in the future after high school for tennis, she would not want to play any other sport. “Tennis is a great way to cooperate and have fun with other people,” Tran said.